What a beautiful salad! It’s cute and delicious. You can really use any dressing you want, too! Enjoy! In a bowl, add bite-sized romaine lettuce. Sprinkle in blueberries, quartered strawberries, and a little feta. Slice english cucumbers into about 1/4 inch slices, and use a star-shaped cookie cutter to cut hearts out of the middle. 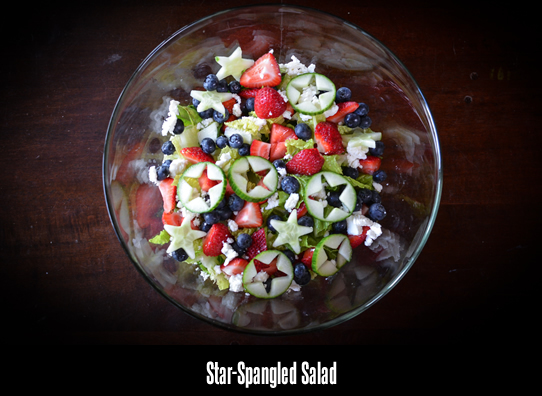 Place the stars and the circles (with star cutout) on top of the salad. Use homemade or store-bought all natural poppyseed dressing and enjoy!